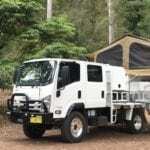 Our Isuzu NPS 75/155 was supplied from All Terrain Warriors with ATW alloy rims. 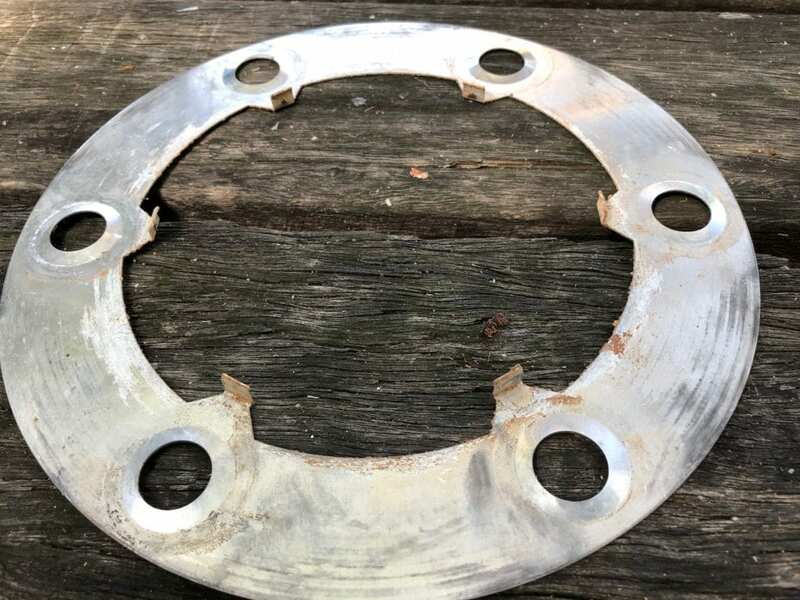 And the rims were supplied with aluminium locating shims, designed to centre the rims on the hub. These aluminium shims are a pain. When removing or fitting a heavy super single, nine times out of ten I would bend and damage the tabs on the aluminium shims. The original set up showing the troublesome tabs. ATW now have a better alternative. And I’m pleased to say there’s no more issues with damaging the aluminium shims… because you don’t need them any more! 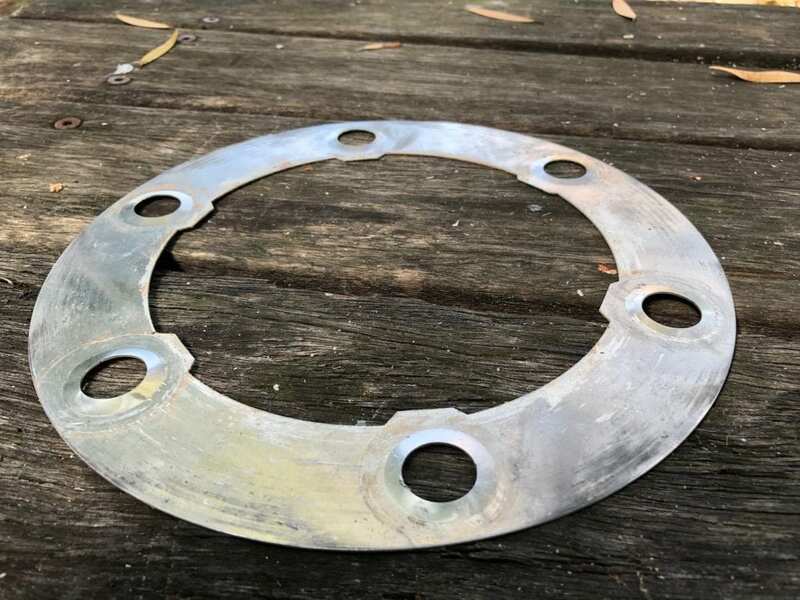 Let’s have a look at why aluminium shims were used. Alloy wheels require special nuts. They’re called sleeved ISO nuts. They have a threaded sleeve which is just a fraction smaller in diameter than the corresponding hole in the rim. They’re also two piece, with a rotating washer. The washer sits against the face of the rim and prevents the nut from biting into the rim as you tighten it. 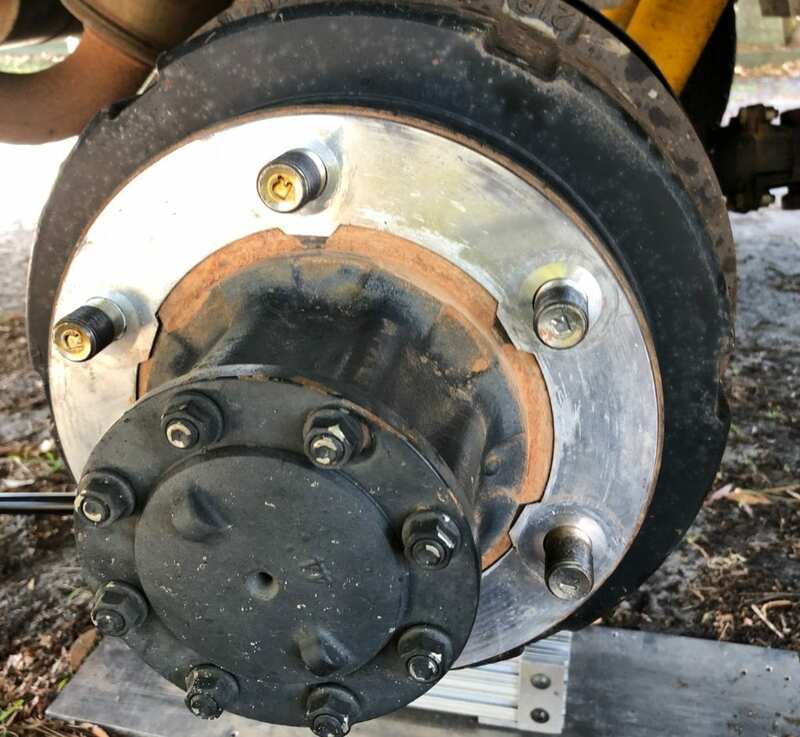 Note: Alloy truck rims are not designed to locate neatly on the hub centre. In other words, the hub centre is not load bearing like you might be used to seeing on cars and 4WDs. This is important to understand. Unlike steel wheels, you can’t used tapered nuts on alloy wheels. A tapered nut would simply chew up the holes in the rim because the nut is harder than the alloy. So how do we centre the wheel on the hub if we can’t use tapered nuts? One way is to use shims. And this is what All Terrain Warriors used for a while. 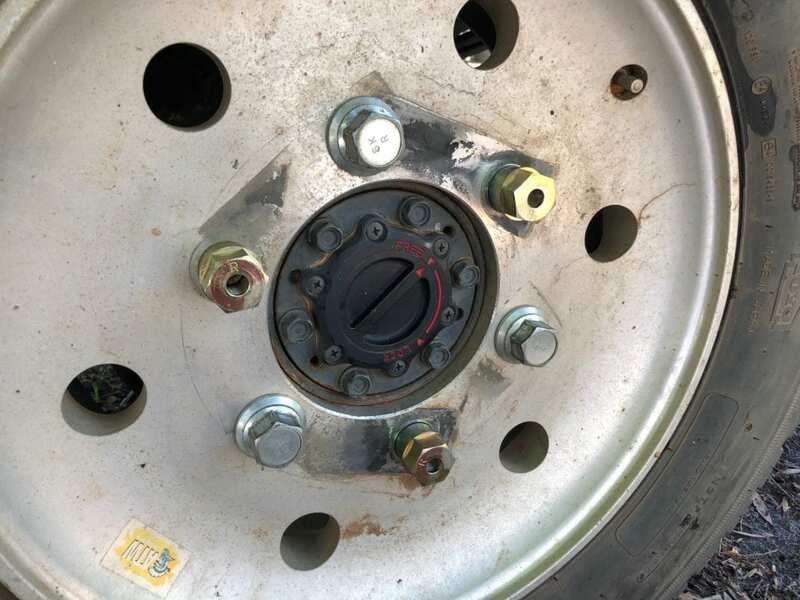 The aluminium shims fit over the studs and are sandwiched between the hub face and the rim. 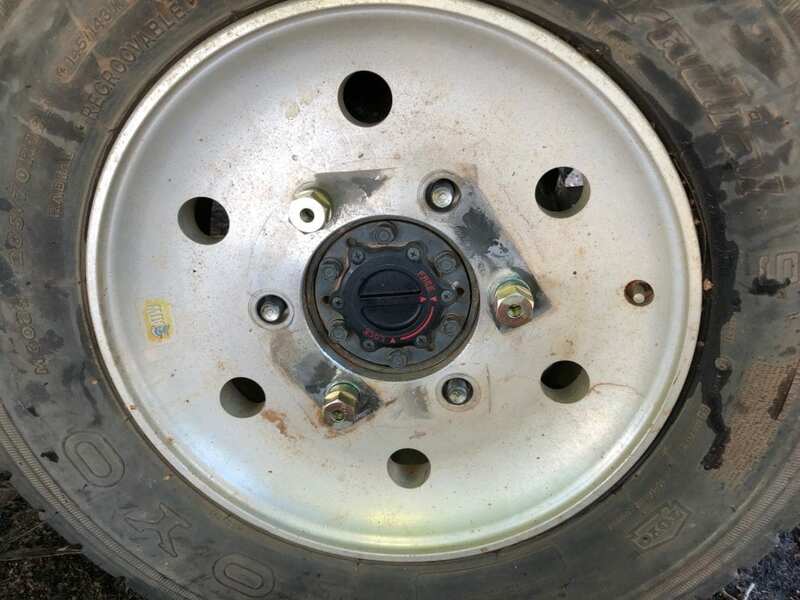 In the photo below, you’ll see 6 tabs that fit neatly between the hub centre and the alloy rim centre. These centre the rim on the hub. The problem with this idea is those 6 fragile tabs. You can easily damage them when changing a tyre. They either crumple up, snap off or fold back onto themselves. Delicately trying to locate a 70kg+ alloy wheel over 6 of these at once is a nightmare. Thankfully, ATW now have a much better solution… tapered locating nuts. You’ll need 3 left hand (for the left side wheels) and 3 right hand (for the right side wheels). 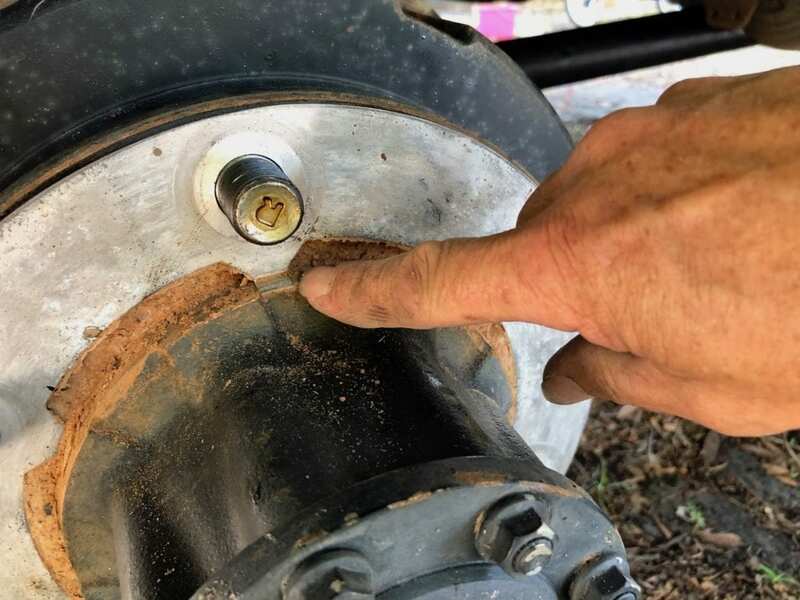 Use a locating nut on every second wheel stud to locate and centre the wheel. Tighten them up, then fit the standard sleeved ISO nuts to the remaining 3 wheel studs. Tighten the ISO nuts then remove the locating nuts. Fit the remaining 3 ISO nuts then tighten and torque as you normally would. With the ISO tightened, remove the locating nuts and fit the remaining 3 ISO nuts then tighten as per normal. Easy! Easy! So much easier than fighting against those aluminium shims. You can do two things with the shims. Either throw them in the recycling bin or re-use them to protect the face of the rim. Tabs cut off, ready to be used as a face plate. You might want to protect the rim face. So cut the tabs off with tin snips, clean up the hub and shims, then re-fit them. They’ll sit there between hub and rim faces, protecting the rim from rust stains. The shim will stay on there permanently now… after I clean off the red dirt of course! This is just a cosmetic thing, but to me it sort of makes sense. Plus it’s easy to do. At last ATW have come up with an alternative to those horrible aluminium shims. I’ve only ever rotated the tyres… I haven’t had to change a tyre in less than perfect conditions yet. 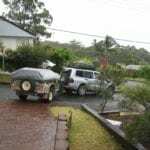 I was dreading the day this would happen, as I knew the aluminium shims would be a nightmare in mud or sand or on a dark, rainy night. These locating nuts just make the job so much easier. I highly recommend you get yourselves a set. Note: We are not affiliated with All Terrain Warriors in any way. This is an honest review of their tapered locating nuts for alloy rims. 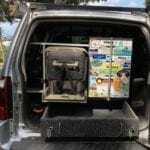 For more information on our Isuzu NPS 75/155, go here. 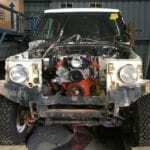 80’s Paint Job - A Retro Pajero With Flares!